Great advice. Although I hate labeling, I have been forced to face the fact that my oldest is gifted. I love what you covered here, especially doing things that are hard. As you know, most gifted children are perfectionists and hate to be wrong. My child loves doing things that are a challenge, but once it’s too challenging – she shuts down. Math – no problem, but writing is something that stretches her. She’s good at it, but hates doing it. Sometimes doing those painful tasks can stretch them in a good way. Thanks for sharing. I will be reading along. We have been learning this the hard way this year with two gifted children. The older one wasn’t being challenged and got bored — and ended up having to drop out of school (now being homeschooled, but wants to return to HS). The younger one struggled in one subject that had previously been easy and failed some quizzes and tests. 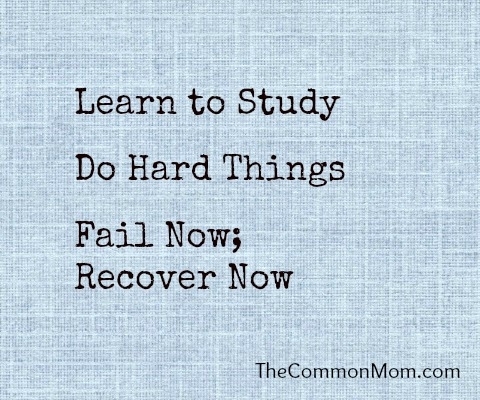 Learning resilience as a teenager is a good thing, but it is hard as a parents to watch kids fail. We hope that lessons have been learned and next year will be better for both. Recovery is a work in progress. Great advice! I think three things are so essential for gifted kids: learn to learn, learn to try, learn to fail–essentially, what your college student told you. Those 100% scores on everything your child brings home feel pretty good until you realize they’re a sign that learning isn’t necessarily taking place. We still struggle with finding an appropriate academic challenge for our son, but in working with his teachers, we’ve at least been able to put a strong math curriculum in place. Academic challenge in a child who’s used to everything coming easily to him definitely isn’t pretty–but it’s essential if he’s ever to face (any) challenges as he matures. His teachers remind him daily to work carefully and slowly, and we help him as needed and remind him that we don’t ask for perfection, but instead for his best effort. I have to admit that those 70-85% grades stunned me at first, but once I realized that they indicated he was learning, I was relieved. In the primary grades, I’ll take process over product. The process will result in knowing how to learn, being willing to approach difficult tasks creatively, and, sometimes, knowing that success can come after failure–if you’re willing to try again. I wish everyone, especially teachers, would realize that just because a student gets A grades doesn’t mean that learning is actually taking place. I’m glad I’m not the only parent that would rather see lower grades and learning actually happening. Now, my daughter’s still in elementary school so these are less painful than they would be in high school or college. Hopefully, this will be a lesson learned before then. I struggle with these very issues (among others) with my gifted 13 y.o. son. He is so accustomed to things comng easily that when a task requires the slightest effort he shuts down nd acts like ive asked him to attempt an impossible feat. And the perfectionism causes him to beleive he is bad at things that take him slight effort. When, in fact, he is actually very good at the given task. Just this week I had a discussion with him that it is more important to me that he learn to accept that imperfection is normal and ok. Also thay he learn to apply himself to “hard” tasks and stick to things that dont interest him. These skills are more important for him than any academic grade. I couldn’t agree more that it’s important for these kids – all kids – to learn how to do “hard” tasks because I find that they’ll usually rise to the challenge! We have a similar story here at our house. Carol Dweck’s book Mindset is a must read for parents of gifted kids. We are working hard now, he is almost 16, to build a growth mindset. Agree with you on Carol Dweck’s Mindset. Another good one is How Children Succeed by Paul Tough. Building a growth mindset is tough but important for all kids – gifted or not. I flunked out of a lame lame state school that graduates illiterates. For all the reasons you sited above. I immediately enrolled as a “freshman” in another college as an alternative (adult returning to school). This college was small, with an excellent reputation. It was a hard lesson to learn, and when I seemed to be falling off the rails again, on of my professors called me at home to demand I return to class and get it together. She mentioned that she had looked up my schedule and talked to professor X and professor Y. She saved my academic career. I have 3 graduate degrees now. *moral of the story- you can recover, but it is hard work. What an inspiring story – thank you for sharing! Thank goodness for professors like yours.